The lighthouse was more impressive distant than close up. Just as the Statue of Liberty symbolically welcomes visitors to the USA, the bright, beaming lighthouse above Prony Bay, served as our welcoming beacon to New Caledonia. Wayne often loves to complain about my habit of dragging him up to the highest point of anyplace we go. 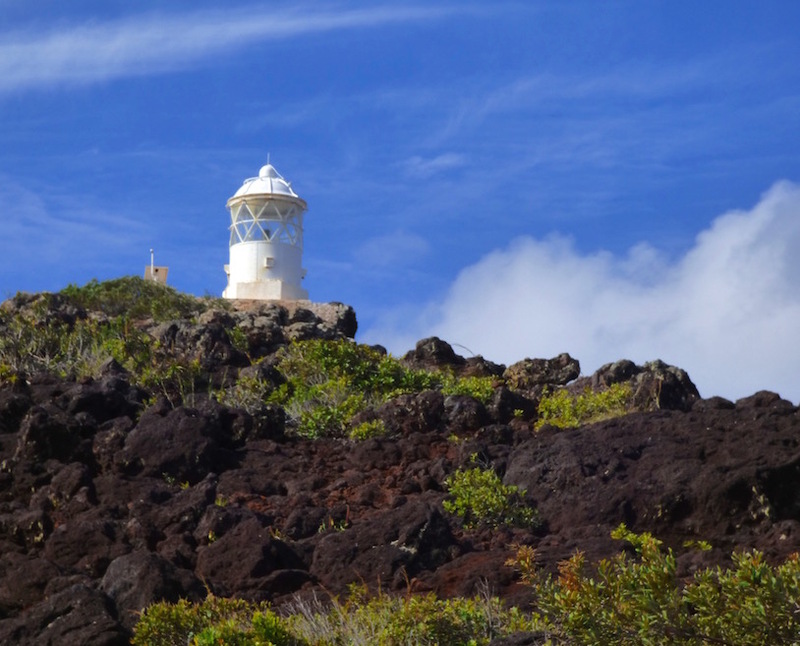 However, he picked Anse Majic - aka Rade De L'Est G as our final Prony Bay stop to hike to the lighthouse. Who am I to turn down walkies - especially when Wayne picks it? 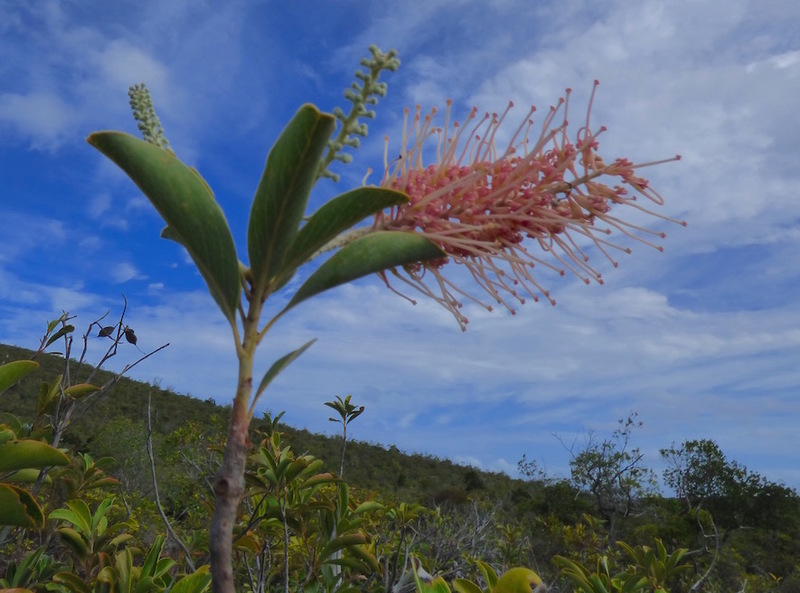 for exotic endemic New Caledonia flora. New Caledonia doesn't seem concerned about investing resources in punishing cruisers who don't make their first country landfall a formal check-in. Thus, to our delight, our friends Steve and Patty of s/v Armagh made Anse Majic their first stop in New Caledonia after their passage from Fiji, as they knew we were there. We've enjoyed many a hike together. However, ever since instigating a somewhat brutal 17 km walk from one side of hilly Fatu Hiva to the other, Steve suspects the rigors of any hike I suggest. I was quick to point out Wayne picked this one; Steve acquiesced, albeit with a bit of good-natured teasing. In particular, there were some lovely floral beauties! Prony Bay, New Caledonia. Ansa Majic's so-red-it's-burgundy beach, New Caledonia. 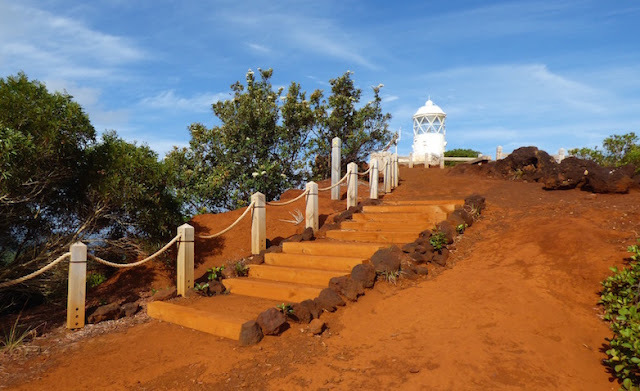 Like most of the other Prony beaches, Oompa-Loompa-like red mud ruled the shoreline. Here the shoreline minerals were so intense, they were nearly burgundy. Steve and Patty were duly warned even my un-Martha Stewart-like boat was prepared for our return with a water filled was bin for our first step back aboard. Fortunately, at Anse Majic, there were mooring balls, which meant at least the anchor and anchor-chain weren't the transport device for additional terra-cotta coloring on our semi-white fiberglass deck. Normally we trust our anchoring more than most mooring balls (see #4 on reasons not to visit Saba), but the ones we've found in New Caledonia government-maintained anchorages to be sufficiently robust for our boat's 16-ton weight. 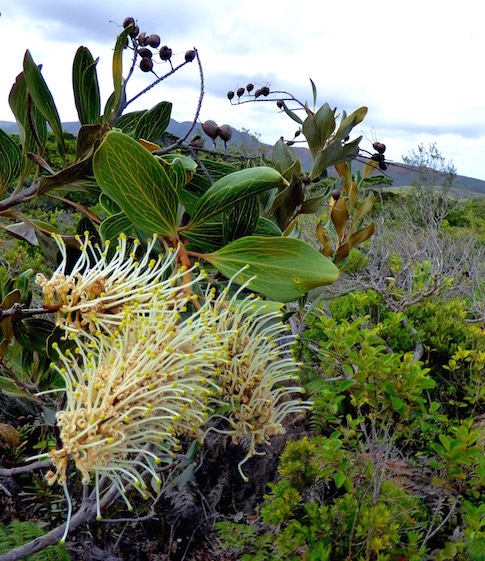 Yes - the colors of the earth in many spots of New Caledonia really are this vibrant! Thanks to nickel and other mineral deposits, the trail up to the lighthouse above Anse Majic practically glowed red-orange, new to Steve and Patty and still a novelty to us. Gazebo overlooking the shoreline just outside Prony Bay. New Caledonia. 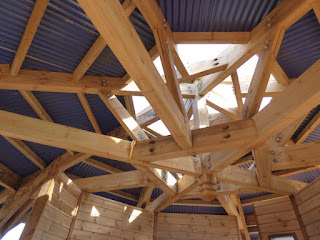 Burly gazebo roof, Anse Majic, Prony Bay, New Caledonia. Considering the trail led to a lookout point, it wasn't too steep or terribly long -- maybe 45 minutes at the most. There was a lovely new gazebo offering an excellent turquoise view over beautiful reefy islands off New Caledonia's Grand Terre. 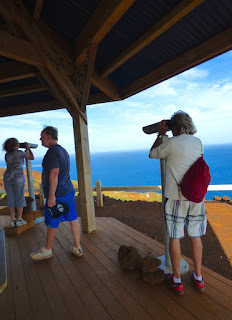 There were even free-to-use mounted telescopes to get a better gander. We were a bit too late for whale migrations, though there was good information about them posted (as well as the telescopes to spot and track them). 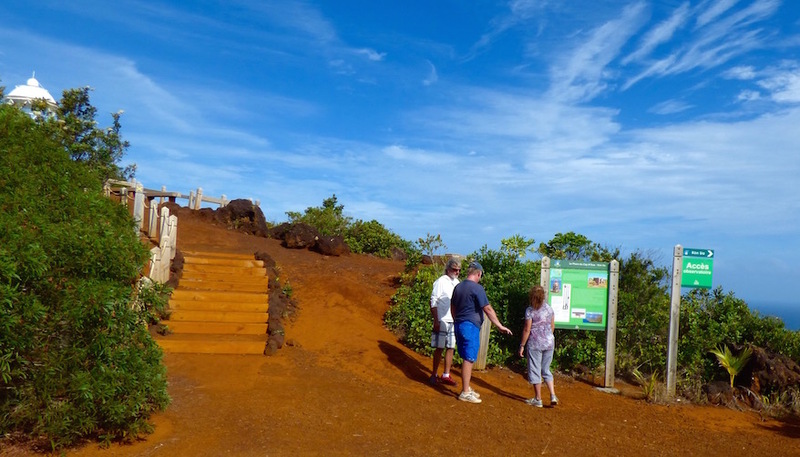 After Fiji and Vanuatu, the well designed and well-marked trails on New Caledonia are a treat! No guides. Free. Public access. Ilot Casy, Carenage B and Prony Village are still our top three favorite Prony Bay stops. The hot (well, we call it more tepid) tub at Carenage A, the cascades and the magnificently glassy calm waters were pretty cool, too. We found Carenage A to be a more attractive and roomier anchorage than Anse Majic, though we far preferred Anse Majic's trails. 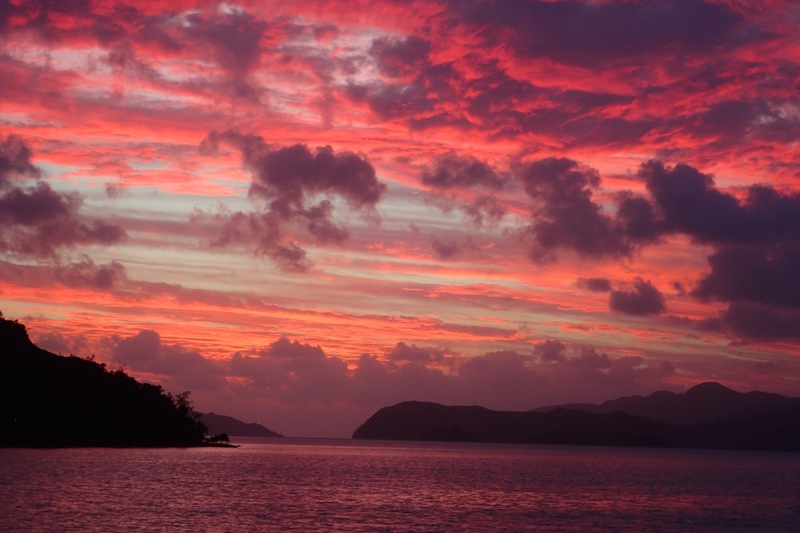 Prony Bay's Anse Majic wasn't the prettiest anchorage, but it had its moments - like these. New Caledonia. The winner between Anse Majic vs. Carenage A? We'll call it a tie. The path back to Anse Majic offered a steller view of both the ocean and Prony Bay. New Caledonia. If you have time to make the same 5 stops we did in Prony Bay - do it! And enjoy! Certainly, there may well be other anchorages in Prony Bay besides these that may well make your favorite list. We were sorry to not have time to check them all out! Rather than blasting back to Noumea, we decided to break up the near 30-mile trip with an in-between stop. We stopped at Baie Ue, 13 miles from Anse Majic as fellow cruiser Frank of s/v Next Adventure told us he liked the dinghy ride mangrove cruise up the river from the anchorage. We decided to give the mangrove a go. 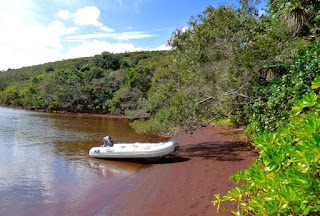 The tide was dropping enough for us to paddle part of the journey, rather than risking turning our outboard propeller into a mud-rooster-tail. Upon returning to our boat, we decided Baie Ue was just too rolly to stay at overnight. We proceeded another 4.7 miles further to Baie Ngo, lured by the prospect of checking out a trail running through a coconut grove. Unfortunately, we were relying on an old "Cruising Guide to New Caledonia" (not be be confused with the newer, but quite expensive Cruising New Caledonia Rocket Guide), and fell victim to what we refer to as the "Ed's Dead" [guidebook] syndrome (click here to learn about that). 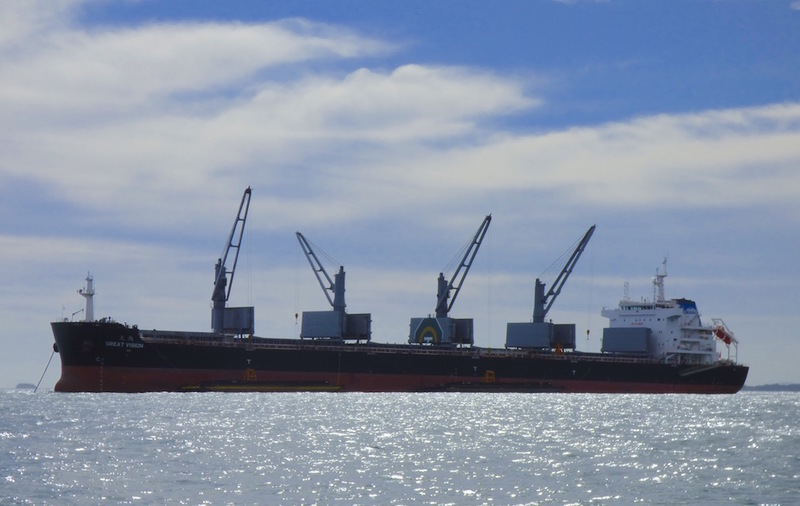 Chinese freighter anchored at the mouth of Baie Ngo. 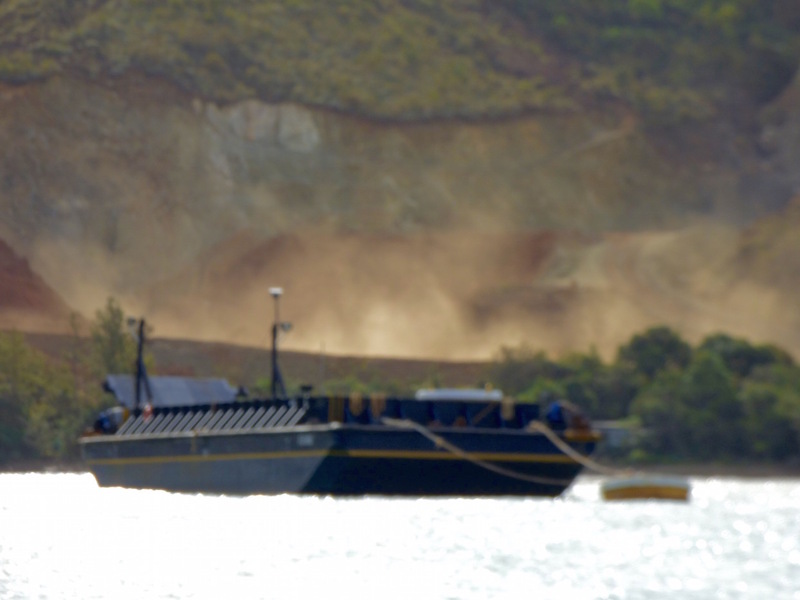 Barges were making deliveries to it 24/7 while we were there. New Caledonia. There was no coconut grove. Instead, the area was heavily mined, and a veritable dust bowl, stirred up by deliveries from truck to barge, and barge to a Chinese freighter. That anchorage too, was rolly, though a bit less so than Baie Ue. But we were ready to call it a night, and start fresh the next morning for our final visit to Noumea, checking out. In Noumea, we would once again bid our long-time, mostly-since-Galapagos cruising buddies Steve and Patty a fond farewell, with no idea when and where we might meet again (outside Facebook;)). We were bound for Australia, to sell our boat and travel. Steve and Patty were returning to New Zealand to sell their boat and travel there, too. We're grateful we were able to introduce them to New Caledonia cruising - really nice place to say hello and "Until we meet again." 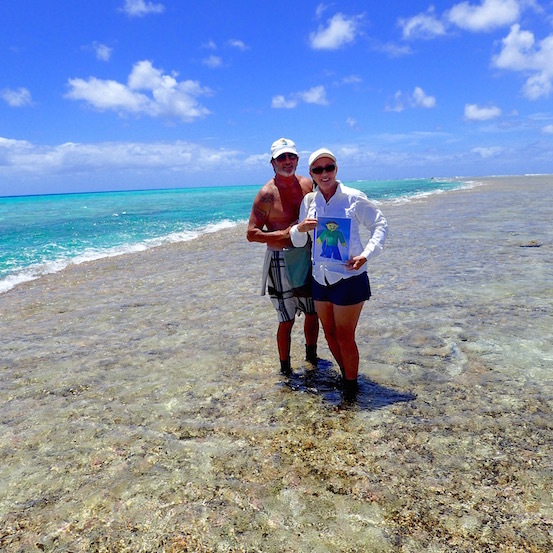 Steve and Patty of Armagh posing with Flat Elmo at Minerva Reef. 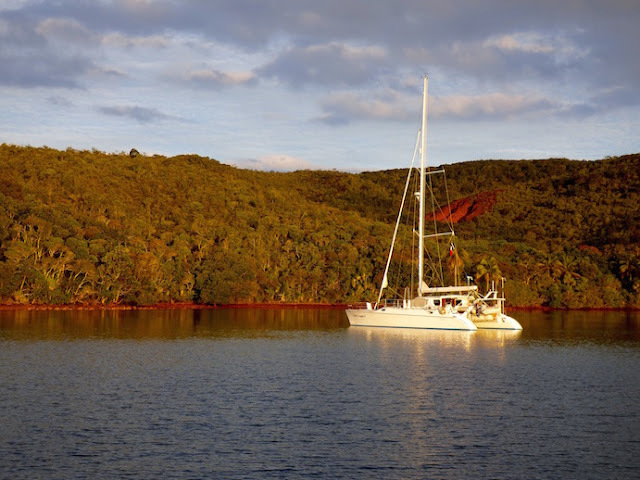 Interested in cruising in New Caledonia's Prony Bay? This Anse Majic sunset was truly epic! Prony Bay, New Caledonia. This is the final post was written about our time in New Caledonia's Prony area, from late September to early October 2016. We are currently in Australia's Gold Coast, at Marine Stadium (S27.56.790 E153.25.424), Queensland territory. 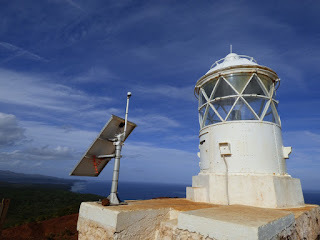 Just a few more catch-up posts from New Caledonia still coming, along with more from our current Australian cruising.